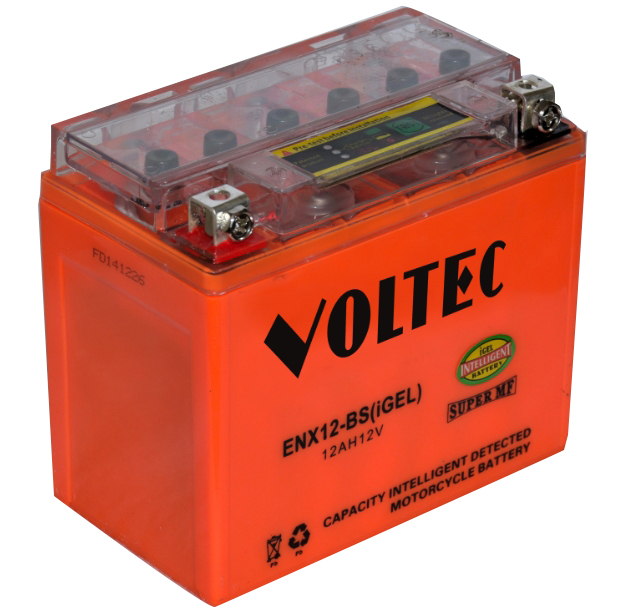 VOLTEC GEL motorcycle battery is pre-filled with the special gel electrolyte, the gel motorcycle battery is easier and safer for use without needing refilling, the phenomenon as leakage or spillage is eliminated even under the condition that the battery case is cracked or damaged. This series is TRUE DEEP CYCLE can be mounted in any position, requires no maintenance and may be transported by Air or Ground without any special handling regulations. When a Gel Cell battery is charged no hazardous fumes escape the battery case, gases are processed within the battery itself. 1. Factory Activated Gel Battery. Sealed Maintenance Free. Colloid electrolyte, and leak-proof. Environment Friendly. 2. No acid mist and pollution to the environment when charging and discharging. 3. High capacity: 10-20% higher comparing to that of VRLA conventional types. 4. Good at charging acceptance. 7. Good performance in the low temperatures, can meet requirements of starting currents in �C30℃to -50℃. 8. Stable characteristic in high temperatures, can meet requirements of its usage in temperature of 65℃ and even higher. 9. Long life span for charging/discharging, cycles up to 800-1500 times.